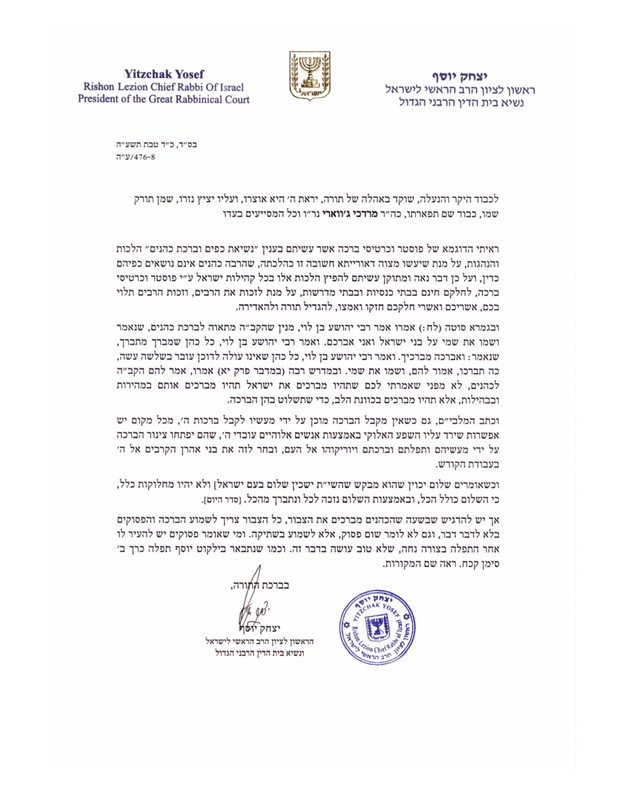 Approbations from distinguished rabbinic authorities. In effort to operate according to the Ruach HaTorah, we consult regularly with the following leaders of Klal Yisrael, as we attempt to raise awareness of the importance of Birkat Kohanim. Recently, we received a Haskama from the Rishon LeTzion, the Chief Sepharadic Rabbi of Israel, HaRav Yitzchak Yosef, shalita. Additonally, Rabbi Herschel Schachter and Rabbi Mordechai Willig, shalita, reviewed and approved the poster and Halacha packet for widespread distribution to both Ashkenazi and Sepharadi communities.